Because the king of Ireland was the most notable absentee from the kingdom, he required a deputy. Throughout the sixteenth and seventeenth centuries, the choice alternated between local magnates, usually descended from the Old English settlers of the middle ages, such as the Fitzgeralds, earls of Kildare, the Butlers, first and second dukes of Ormonde, and Richard Talbot, ennobled as earl of Tyrconnell, and generals or nobles despatched from England. Neither option avoided dangers: locals promoted themselves and their cronies; the imported seldom had much grasp of the personalities and nuances of Irish affairs. 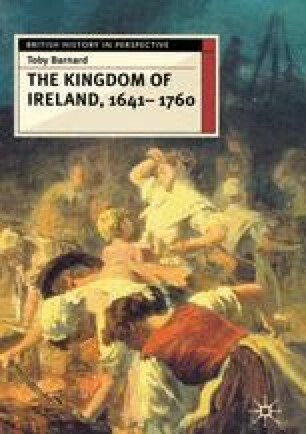 English ambitions to subordinate Ireland more fully required the more frequent use of Englishmen, to the chagrin of loyal locals. For a time this trend away from the employment of the Irish-born was masked by the long viceroyalties of the two dukes of Ormonde, which stretched, although not uninterruptedly, from 1643 to 1713. Thereafter, no one of Irish birth was appointed to this, the highest office in the English government of Ireland. Just as the lord lieutenancy told of the special character of the Ireland within the dominion of the English monarch, so too did other important posts on the official Irish establishment.